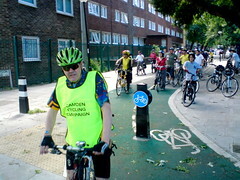 This has from 2007 been our annual Bike Week ride all round the boundary of Camden, visiting every ward in the borough. The distance is 22 miles with a lunch stop in Golders Hill Park. We start at the Town Hall in Judd Street then ride clockwise round the borough; when we get back to the Town Hall, we continue through the remaining internal wards finishing at Hampstead Town Hall. There is usually a good crowd of all types, sizes and abilities and plenty of marshals to ensure safe crossings of major roads. It’s fun! The route was made a little shorter in 2017. The map of the route for 2017 is here. The flyer for 2016 is here Leaflet Ride All Around Camden 2016. Map of the route for 2016 here. This is an improvement on the previous routes. The flyer for 2014 is here. Note that from 2009-13, the route included Regents Park Broad walk as shown on the map linked above. But sadly, we were not allowed to use it in 2014.